NXG Electronics has brought out its new Dual SIM super slim NXG Proton 5.5 inch Phablet with HD resolution powered by cortex a7 quad core processor and this is the first time this mobile manufacturer has ever launched a smartphone in India and so we have a new player in the Indian Smartphone market. This phone comes with a colossal 5.5 inch IPS screen with HD resolution (1280 x 720p) but the pixel density is not as good at 267 Pixel Per Inch (iPhone 5 has a PPI of 360). The phone employs a 1.2 GHz Quad-Core MediaTek MT6589 with PowerVR SGX544 GPU(similar to that in MMX A116), which is quite common for this price range cell phones, but still one step below the UMI X2 Turbo processor. 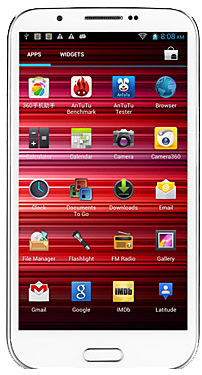 It incorporates android 4.2 jelly bean Operating System with a 1 GB RAM (DDR3), 8GB internal storage, extendable up to 64GB using micro SD card. It has a 13 MP AF rear camera with LED flash, enabling good quality pictures under poor lighting conditions and capable of recording videos at 720 p resolution, however we have seen that a similar MT6589 Chipset can record full HD videos as in MMX A116 handset. A 5 MP front camera is a uncommon bonus feature for this phone. The battery backup is magnificent, rated at 3600mAh, which should be sufficient enough for you to use it for up to 3 days without charging (when you are not using it aggressively by not watching videos and playing HD games for hours). Samsung Galaxy Note 2 has the same screen size and it had the capacity of 3100 mAh which was the best among any smartphone with the same screen size but this one seems to overtake that. I went to NXG Head Office and seen the Demo of NXG PROTON. It having super camera clarity,resolution is also good.also checked the battery it having 3600 mAh Battery,no doubt about that.I like It very much and going to gift it to my Younger brother. I badly want to see a review of the device on youtube. How long will it take????????????? we will try to get this device as soon as possible.